The Very Cherry Christmas drink tastes quite a bit like a chocolate covered cherry. It blends cherry vodka with the flavors of chocolate and Irish cream to create a flavor that’s rich, sweet and easy on the palate. This is a great one for holiday parties. It’s also a great drink to leave out for Santa with his plate of cookies. It looks almost like a glass of milk, but it’s so much better than that. I mean, hello! It’s got vodka. Specifically, it’s got cherry flavored vodka. If you’re wondering what’s a good brand, it’s a little hard to say. Cherry is a tricky flavor to get right. Almost every brand gets at least a couple of reviews which say it tastes artificial – even while all the other reviews think it tastes natural. I’ve used Three Olives and Svedka cherry to make this cocktail, and they both taste good to me. Your mileage may vary, and you can read reviews to decide for yourself. This is a very sweet cocktail – so sweet that you could actually serve it as a dessert. In fact, that’s a great way to enjoy it – served after a nice meal. It really does taste surprisingly like a chocolate covered cherry. The basic recipe for that candy is a cherry wrapped in some sugary goo inside a chocolate shell. So this drink has cherry, chocolate… and Bailey’s Irish cream. The Irish cream adds sweetness and a creamy texture, but it also has some other notes. It’s a little bit caramel and nutty, and that enhances the chocolate and cherry flavors. The cherry flavor is dominant in this drink, just like it is in a chocolate covered cherry. You taste the cherry first, and then the Baileys and then the chocolate. This is a soothing, comforting drink that you just want to sit back, sip and enjoy. It’s perfect for an evening by a roaring fireplace. But it also makes a great drink to serve at a party. You can make up a pitcher in advance and let it chill in refrigerator until guests arrive. You can make the cherry garnishes in advance, too. 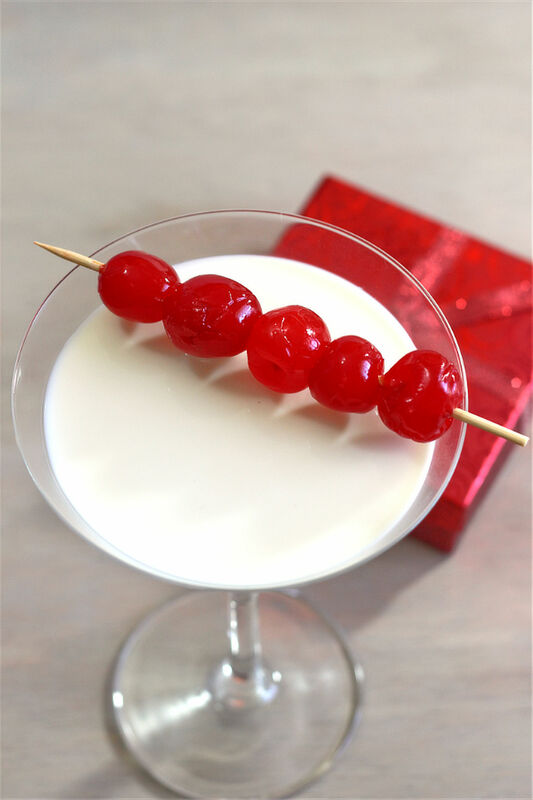 Just dry some maraschino cherries on a paper towel and then thread them onto skewers. 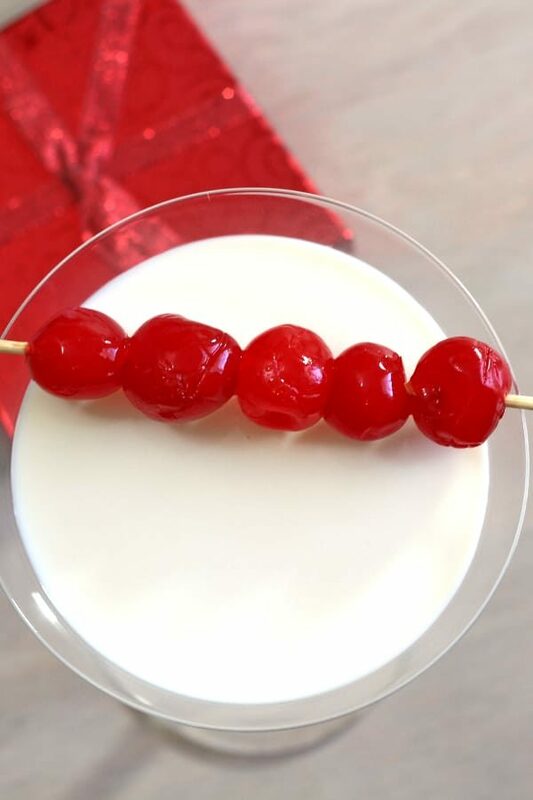 If you want something a little nicer than grocery store maraschino cherries swimming in heavy syrup, try Luxardo’s original maraschino cherries – which are much more life-like – or maybe even some bourbon cherries. 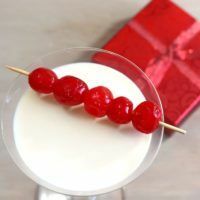 If you enjoy this drink, you should also try the Chocolate Cherry Cha-Cha, which also tastes a lot like a chocolate covered cherry, but uses a completely different set of ingredients to get there. You should also check out the 12 cocktails of Christmas, a list of all the best Christmas drink recipes from Mix That Drink. There are lots of fun drink options on that list! The recipe calls for optional chocolate sauce drizzled on the sides of the glass. It does give the drink a nice look if you can do it right. I really tried to do it for the picture, y’all, but it kept getting away from me before I could snap the pictures. And that’s why none of the pictures here show the drink with chocolate sauce. You have to chill the glass first, so the sauce will stick. Then, very soon after drizzling the chocolate sauce into the glass, you pour the chilled drink mixture straight into the middle of the glass. With luck, it will preserve whatever pattern you made with the chocolate sauce. With my luck, it will just smear it around so it looks like you poured a nice cocktail into an incredibly dirty glass. The Very Cherry Christmas drink recipe tastes quite a bit like a chocolate covered cherry. It blends cherry vodka with the flavors of chocolate and Irish cream to create a flavor that's rich, sweet and easy on the palate. This is a great one for Christmas parties. Fill a shaker with ice and pour in the vodka, Baileys, the chocolate liqueur, and cream. Optionally, drizzle a chilled martini glass with chocolate syrup. Strain the mixture from the shaker into the glass. Garnish with cherries on a skewer. Is there some way to make this non-alcoholic? It wouldn’t have exactly the same flavor. But I’d try something like Bailey’s flavored creamer for coffee in place of the Bailey’s. For the chocolate liqueur, I don’t know of anything that will taste much like that, but maybe you could blend some chocolate syrup with some simple syrup. For the cherry vodka, maybe cherry juice? It’s not going to be whitish like the alcoholic version, either. You might be better off with one of our mocktails. My son in law made this drink for us this past Christmas and New Years. Delicious! You must buy the deluxe cherries. They are phenomenal.